Direct Supply can Heat Treat pallets that require ISPM-15 Certifications, as well as crates, lumber, or dunnage! We offer full load pricing or LTL quantity pricing for our Heat Treating Services so you are not forced to over-buy! We stamp each pallet that has been treated for easy identification, as well as provide a Certification from the governing body along with the delivery of the product for your records! Request a quote to see how we can help. Why Use Heat Treated Pallets? We live in a world where it is relatively easy to transport materials across great distances. Most of these materials are stacked on pallets in order to be transported in the best, most secure manner. People will usually focus on the products being transported instead of the pallets or containers on which they are carried. Since these pallets are traveling into other areas, it’s important to pay attention to their condition as well. That’s where heat treated wooden pallets come into play. The pallets are loaded into a massive Heat Treat Chamber. Probes are inserted into random pallets to help determine the proper moisture content and heat present in the pallets. Once the appropriate time has lapsed at the correct temperature, the pallets are removed, stamped for verification, and then shipped! The largest reason that pallets are heat treated is to protect the health of people everywhere. Wood products bring along with them the possibility of disease and insects spreading that could negatively impact the local environment. An instance of this was in the 1940s after World War II. The Formosan termite entered into the United States. It is thought that they entered through port cities and continue to thrive on cargo shipments of wood and cellulose-based goods. International Standards For Phytosanitary Measures No. 15, or ISPM 15, addresses the need to treat any wood materials shipped between countries that are thicker than 6mm in order to prevent the spread of disease and insects. This affects all packaging materials that are made out of wood, including pallets, dunnages and crates. The wood must be debarked and then either heat treated or fumigated with methyl bromide. After this process is complete, it must then be stamped with a compliance mark. The exposure of chemicals through fumigation can be detrimental to one’s health, so using heat treatment is much safer for those that need to handle it. Heating the wood is a natural way to preserve it and keep it from decomposing as quickly. 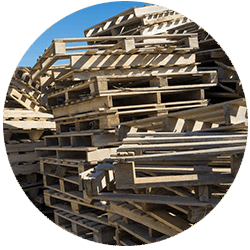 Buy Heat Treated Pallets from Direct Supply!